It's almost release day (which will be June 1), so I'm jumping in with another enthusiastic recommendation (if you read mystery reviews, you've seen some already!) 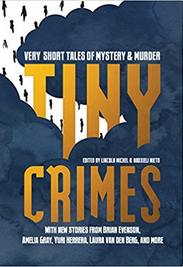 for TINY CRIMES, a compact, neatly designed, and very, very enjoyable set of extra-short stories, aka flash fiction, that set out mysteries, suspense, crime, or astonishing darkness. It's as if editors Lincoln Michel and Nadxieli Neito skimmed the best and strangest tales from all the strongest mystery magazines going, and packed them into this intense block of well-designed illustrated pages. Thirty-nine of them. Many are written by specialists in the short story form -- which isn't my usual area of reading, so the names of the authors were new to me, although their credits at the back of the book are fierce and impressive. Two particularly thrilled me: a New England tale well spun by Elizabeth Hand, and an unforgettable surreal one from Japanese noir novelist Fuminori Nakamura. I also like the one from Paul La Farge, which begins "The next to last time I saw Polanski" (talk about classic! ), and couldn't stop marveling (with dark chuckles) at "Hygge" by Dorthe Nors. Treat yourself. As far as I can tell, there's only one drawback to buying this book: You won't want to pass it along to a friend ... because there's always going to be a moment when you think "That story I liked so much, I should read it again" -- and this one's going to have to stay on your shelf. Or even on the bedside table. From Black Balloon, published by Catapult. Good stuff.